A louvred fluorescent fixture that was saved from my university's former bookstore. I got it a local salvage yard. It had been sitting there for a few years and the guy gave it to me on account that he didn't know if it worked or not, so off I go with it. It is a 8 footer tandem, had a Magnetek electronic ballast from 1999, but I replaced it with two Universal black label ballasts (full power) from 1986. Works a charm, the hardware store only had three F40 daylight, the odd one is a F34 cool white. The louvres were quite rusty, I sanded and sprayed them. The rest of the fitting has to be painted next summer. Yes, that is why I am not really in a hurry to get all the same. I will probably end up getting another daylight, though. Awesome! In grade school, we had 4x40w louvered fixtures connected together in two rows. They all had aged GE inside etched lamps that were starting to go EOL. Unlike the 4x40w troffers, these lamps were paired side by side. When they would replace a pair with new (back in '80) Sylvanias, you could see the slight color difference in one section even though they were all /CW. The sylvania's always had a slightly more greenish tint compared to the GE more pinkish tint. Very cool! When I was in school, there were louvred fixtures very similar to these and I remember the colour difference with lamp replacements. They only replaced the EOL lamp, not the pair. There was a mixture of GE, Philips, Service, Sylvania, Bullseye, Westinghouse, all cool white. In my elementary school (the fixtures are still there but electronic now), the louvres were on V shaped springs that compressed when pulled down. Oftentimes, after relamping, the janitor failed to push the louvre properly resulting in uneven louvres along the row. I always had a preference for the 2-lamp type instead of the 4-lamp type. I also find it adds interest in a long row if one fixture has EOL lamps and appears dark. Nice! Almost looks like two separate 4ft sections bolted together? Looks better as a tandem though in my opionion. Looks great! From the pic, the rest of the fixture doesn't even look like it needs to be repainted. This is a real tandem section. The ballast channel is one 8' piece. The reason it looks like two sections is because there is a divider between the 4' sections. On that divider, there are hooks and the end blades have matching holes. That is how the louvre is attached to the fixture. If I had the space and another fixture, I would attach them end-to-end to make a row. The rest of the fixture is in relatively good shape, but if you were to look closely you would see it needs paint. I have cleaned it, though so it looks better than when I got it. Ah I see. Really cool fixture regardless. I don't have any room in my house where I could fit an 8ft fixture lol (well, I could fit one in some rooms but the fixture would be out of proportion in relation to the room lol. Same here, that's why it's in the basement. Even the basement. I have a finished basement so my parents won't allow fluorescents in that part. 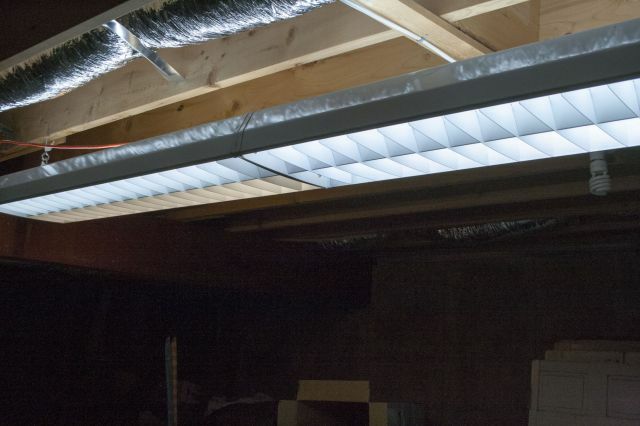 I have two small rooms in the basement that are unfinished: the laundry room and utility room (furnace and hot water tank) so I only have fluorescents there and inside the finished garage. I love it, how old is it? I'm not sure but I'm guessing late 1960's or early 1970's.